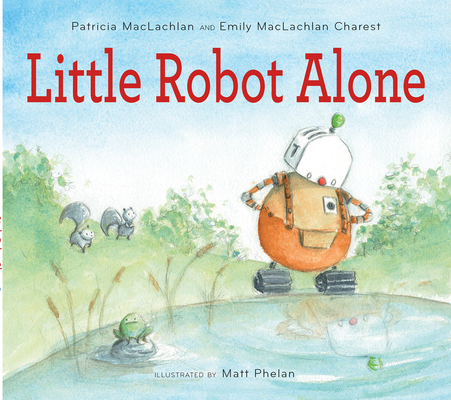 In this charming picture book by Newbery winner Patricia MacLachlan, Little Robot is lonely—until he has an inventive and creative solution. Little Robot’s life is peaceful—yet maybe it’s a little too peaceful. But wait! He has an idea. With a little hard work, perseverance, and resourceful thinking, can Little Robot build his way to the perfect cure for loneliness? Patricia MacLachlan is the author of numerous books for children, including the beloved Newbery Medal-winner Sarah, Plain and Tall. She frequently co-writes picture books with Emily MacLachlan Charest, and she lives in Massachusetts. Emily MacLachlan Charest has co-written several picture books with Patricia MacLachlan. She lives with her family in Massachusetts. Matt Phelan's many books include the popular picture book Very Hairy Bear by Alice Schertle and the innovative graphic novel The Storm in the Barn, winner of the Scott O'Dell Award. He lives in Philadelphia. Visit him online at mattphelan.com. Please note that the website database does not necessarily reflect the in store availability. If you wish to check actual in store stock, please call 337-2681 or 1-800-295-BOOK (2665) during store hours. ©1999-2015 Prairie Lights Books. All rights reserved.